They have a beer garden out the back (which the interweb says has a trampoline! ), and there's a pool table too. A blackboard seen outside in November 2007 advertised sausage and chips (£2.50), saveloy and chips (£2.50), wings and chips (£3.10), pie and chips (£2.60), cornish pasty and chips (£2.30), and jacket potato (£2.25, all extra fillings 50p). Don't know what times these are served though. 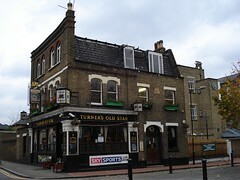 The name of this pub is a reference to the painter J M W Turner, who apparently set up his mistress as landlady here. Last visited by Kake, doop, Bob, Ewan, Kat, Adam, etc, 18 November 2007. Last edited 2017-09-15 18:31:31 (version 8; diff). List all versions. Page last edited 2017-09-15 18:31:31 (version 8).